Video selling is your secret weapon to stand out in your buyer's inboxes and get a response. Your buyers are receiving 100+ automated sales emails everyday and growing immune to this type of approach. If you send the exact same email as every other salesperson, you are not giving your prospect any reason to pay attention to you. Video provides a level of personalization that cannot be faked. Even if it only takes you 2 minutes to send a video - the same amount of time it takes to leave a voicemail - it provides a world of difference to your buyer. You can build a face-to-face connection, show your credibility through your tone of voice, facial expressions, and body language, and more succinctly convey your value by showing your product in action. Surprisingly, even though the statistics are so impressive, only 6% of sales teams currently use video anywhere in their sales process. This means there is still a huge opportunity for early adopters. Let’s get you up and running with personalized videos so you can beat the crowd and enjoy. You have about 90 seconds to convey your message…. This is when you convey value to your viewer. Don’t just sell your product, educate. Tell a story. Show them something cool. You’re telling a story! Don’t be generic. Tailor pitch to customers unique needs. Once a buyer’s attention has been captured, a video is a fantastic medium for succinctly communicating a lot of information. It has a higher informational throughput than text, audio, and images alone because it combines all three. Seal the deal with a powerful call to action. 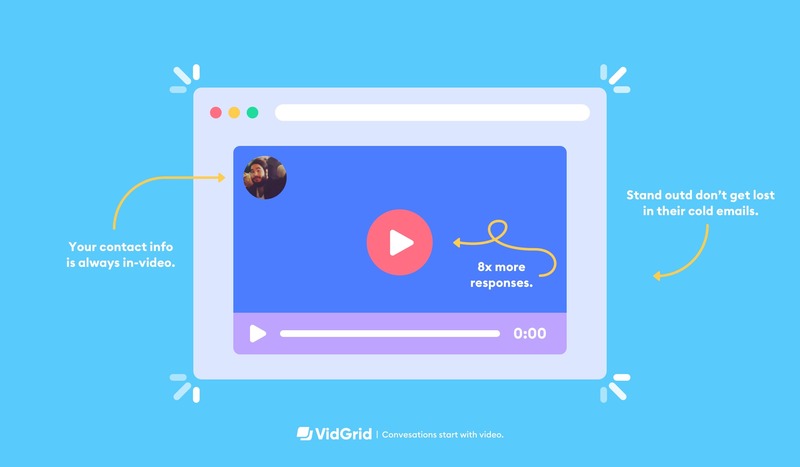 Tell them what the next steps are, and give them the opportunity to complete the action within the video player for ultimate simplicity. If you have 10,000 people who fit your target persona list, you obviously can’t make a video for each person that way you could bulk email 10,000 people with the click of a button. That’s part of the charm, but also inconvenient. It is therefore imperative that you qualify your leads ahead of time. Has your prospect downloaded a buyer’s guide? Or spent a minute checking out your pricing? Or engaged with one of your 1-to-many prospecting videos? Get me water because this lead is 🔥🔥🔥! Now is the perfect time to send them a quick video. Introduce yourself, make your pitch, and setup a discovery call. Introduce yourself with a personalized video. You can refer to what they have done so far on the trial, and give them specific tips using your product that apply to them. This way, they know if they schedule an introductory call with you, there will be more value for them. Just because someone signs up for a demo does not mean that they will attend. If you allow visitors to schedule demos on your website, there is a pretty good chance that you have had the unpleasant experience of waiting 15 minutes for a no-show. You deserve better! After someone signs up for a demo, send out a quick video introducing yourself and letting them know you are looking forward to a call. They will be a lot more likely to show up if they know there is a human on the other side of their calendar invitation. You had a great conversation with a hot lead at a conference? Well, so did 50+ other vendors… Send a personalized video to remind the lead what you spoke about and why they were interested in your product. You just for off of the phone after talking to a hot lead. You wrote down their use case and questions asked. Now is the time to give them a small taste of what is to come! Send a video to your prospect thanking them for the phone call, answering or asking a question, and give them something to look forward to before your next meeting. Oh, you forgot to schedule the next meeting because you were so pumped? No worries, let them schedule time with you in the video. Are you already traveling for some reason? Leverage the short span of time you will be in that city to create a sense of urgency with your customers to schedule meetings within that time frame. Were they waiting for a specific integration or feature? Send them a personal note to announce it’s arrival - and show them what it looks like through video. Has your prospect had a birthday or received a promotion or award? Congratulation them! With the personalized sales video, personalization is key. Spend time learning your contact and their challenges, and then use this information to connect on an intimate level. Your prospective customers are more likely to give you the time of day when they see that you have given them the time first. Use the video as an opportunity to tell a visual story. You are not just replacing a phone call with a video voicemail - you are unveiling a whole new perspective. Let buyers see crucial highlights of your product in action.